Mental illness novels everywhere! Suicide Novels everywhere! It's kind of crazy that all of a sudden novels about suicide and depression started becoming the topic of YA novels (I could be exaggerating though). Despite the popularity of the topic, I'm still attracted to it. As I read through My Heart and Other Black Holes, I wasn't really feeling anything for both Aysel and Roman. While I do see where their problem is coming from and even though how hard I try to really consider their mindset, it's just not working for me. Let's talk about Aysel. While I do understand Aysel and I'd like to see how she lived her life after her father's crime, I just can't fully get there. Aysel's home life doesn't seem bad as she makes it sound. Her mother sounds really normal to me. She doesn't really sound like someone who don't like her there. Her, half sister, on the other hand, doesn't sound so bad as well. All throughout the book, it really felt like it was Aysel who's creating the distance from her family. Aysel's development was really good though. Right at the beginning I kind of did not like her because as I said, I don't see anything wrong with her home life (and school life). While I still don't see anything bad going on with her aside from how close her mind is, I find her development to be really smooth. I like how she slowly finds a reason to live and how she had the mindset of also convincing Roman to live. My Heart and Other Black Holes had a really predictable story. I knew where things were going right from the beginning. Perhaps that's the reason why I barely care about the characters. 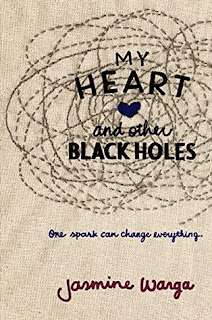 OVERALL, My Heart and Other Black Holes is a wonderful novel about finding a reason to live. This is more of an 'okay' read for me. I liked Aysel and Roman but I did not completely feel for them yet I do love the ending. 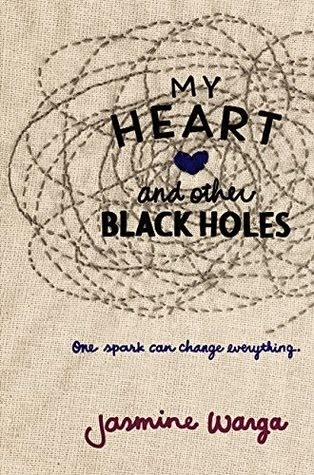 My Heart and Other Black Holes is an uplifting read. It's certainly recommended for those who enjoys novels about suicide, depression, and finding reasons to live.